I’ve already mentioned that pizza is a weekly ritual for my husband and I, but we try to keep it as healthy as possible by making our own crust and using “good for you” toppings. A few weeks ago I had the idea, thanks to�a Rachel Ray magazine from last fall,�to�use�one of my favorite fall staples, squash, of course, as a topping.� Her recipe called for ricotta cheese in place of a traditional pizza sauce but I found that it left the pizza a little plain.� So, last weekend, I came back for round two�using�a local smoked cheddar instead of the ricotta and added some fresh thyme to give it more flavor.� This one was Yum-O! 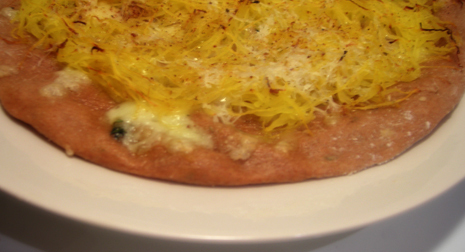 Pre-heat oven to 400.� Slice squash in half, rub the inside with olive oil, salt, pepper, and nutmeg and place flesh side down in a baking dish.� Bake until tender, about 30-40 minutes.� Let cool enough to touch, then use a fork to scrape spaghetti-like strings into a bowl.